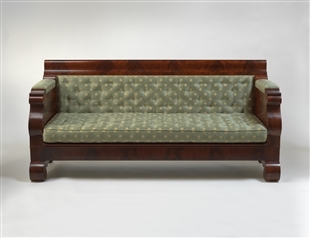 About this object Massachusetts Representative Robert Winthrop briefly served as Speaker before serving in the Senate. Democrats retained control of the Senate after the wartime 1846 elections, but Whigs took the House. 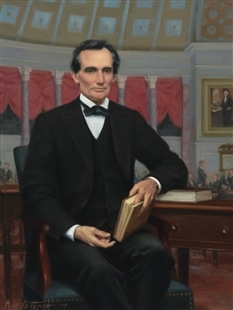 They submitted a bevy of antiwar petitions including one by Illinois Representative Abraham Lincoln, who served his single congressional term in the 30th Congress (1847–1849). 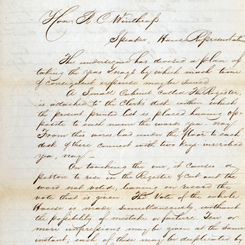 The Mexican–American War ended with the 1848 Treaty of Guadalupe Hidalgo, which added much of the present Southwest to the country. Shortly after the war ended, Massachusetts Representative John Quincy Adams, dubbed “Old Man Eloquent,” died in the Speaker’s Room in the Capitol after falling ill on the House Floor. 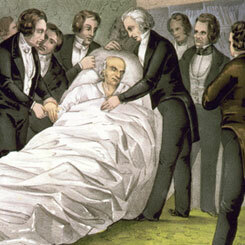 Representative and former President John Quincy Adams of Massachusetts suffered a fatal stroke on the House Floor. Inventor Francis H. Smith of Baltimore petitioned the House to develop a legislative telegraph to tally the yeas and nays.